As a Catholic mom, I'm always wanting my children and myself to seek God daily and encourage each family member to spend daily quiet time in prayer alone. Our family prays together often and each morning we have our "Couch Catechism" family devotion time before our homeschool day starts, but making time for individual prayer is so necessary and fruitful, but can be challenging at times! 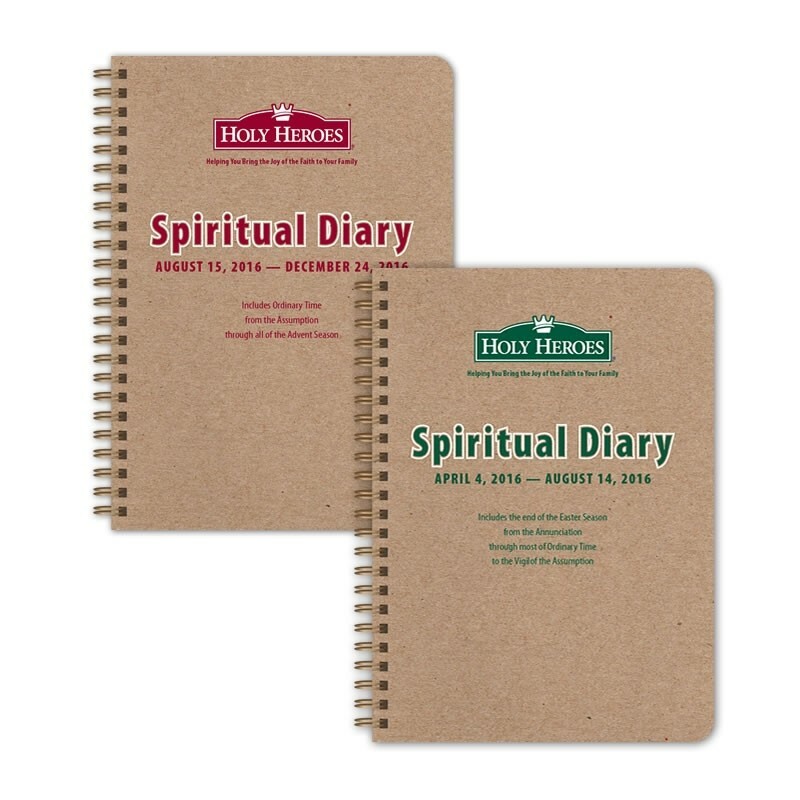 Holy Heroes, a wonderful company that offers products to "help you bring the joy of the Faith to your Family", has created the new Holy Heroes Spiritual Diary that is an excellent tool for the entire family (yes, for children AND adults!) to make spending time with our Lord not only possible, but also reflective and fruitful. 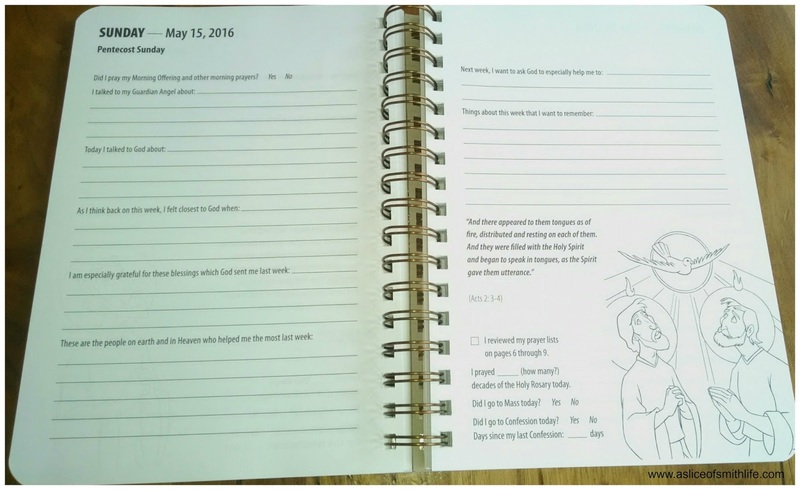 The diary is intended to be used each day for about 10-15 minutes. Holy Heroes sent me copies of the April 4, 2016- August 14, 2016 Spiritual Diary in exchange for this review. 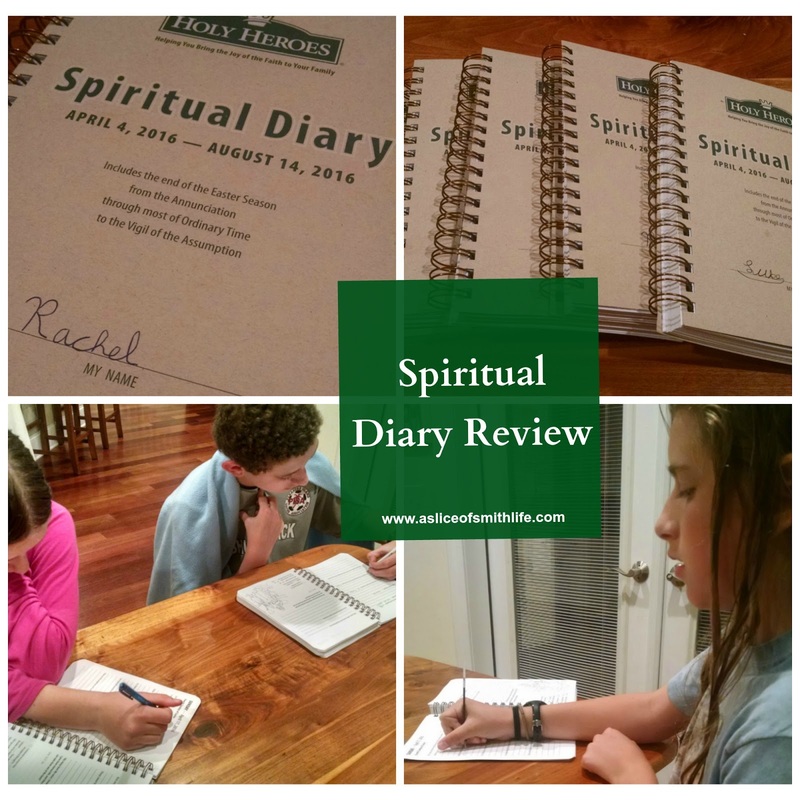 So what is the Spiritual Diary? Briefly, I like to think of the diary as a daily "date" with God as I use the diary to think, reflect, pray and write about what is on my heart, mind and soul. The ultimate diary to help children focus and reflect every day on what God is doing in their lives, and what He wants them to do tomorrow! * TWO pages for every day's memories, with questions to prompt spiritual reflection for children aged 7 and up. * A step-by-step guide for Confession, plus removable pages to carry into the Confessional, with directions for confessing and space for a child to write down sins committed. * Much more to make this a daily resource and a keepsake for the future! Here is a photo of the inside of the diary that I took to give you an idea of what each day looks like. Each day doesn't have the exact same questions, but many questions are the same from one day to the next. For more inside views, you can watch the video on the Holy Heroes website. I love that the diary records feast days. (For example, Pentecost Sunday is noted in the photo for May 15, 2016) I enjoy living liturgically with my family with food, fun and activities and being able to use the diary as a quick reference for upcoming feast days is a definite plus! Daughter, age 16: "I enjoyed how the diary keeps a record of mass attendance and the last time I went to confession." Daughter, age 11: "I like recording what I thought about and did during the day." Daughter, age 8: "I love listing my prayer intentions in my diary to help me remember who and what I'm praying for each day." As a parent, I have enjoyed sitting down each evening with my diary to write in another entry. It has helped me reflect on the day's events and I like that some of the questions focus on what I have been grateful for during the day. Too often, I lay my head down each night and only remember the day's big challenges and headaches rather than all that I should be grateful for. The Spiritual Diary has helped me redirect my thoughts to what went right with the day and be grateful for my many blessings. I'm also more aware of what I want to work on spiritually for the next day since I'm recording my thoughts along my spiritual journey. The Spiritual Diary is full of great prayers and information, but I think it could be an even better tool if the daily Mass readings were listed on each day to encourage users to look up scripture and pray with the Word of God while filling out the entries. 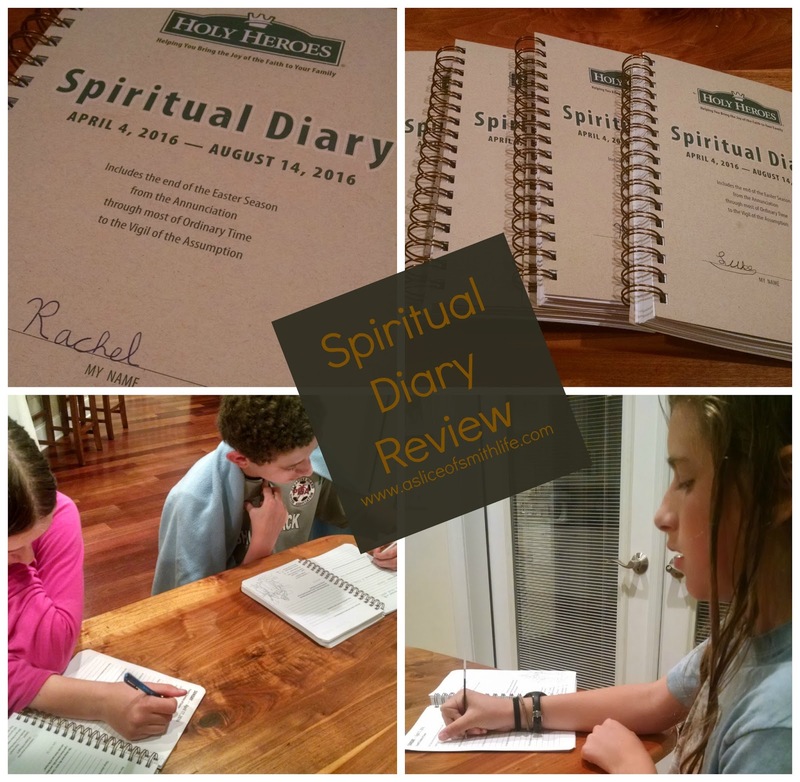 The Spiritual Diary takes self-discipline to fill out each day, which is always a challenge for me personally and with our busy family schedule. We have skipped several days lately because of our hectic evening schedules, but I'm hoping to get back on track soon with our less hectic summer schedule! 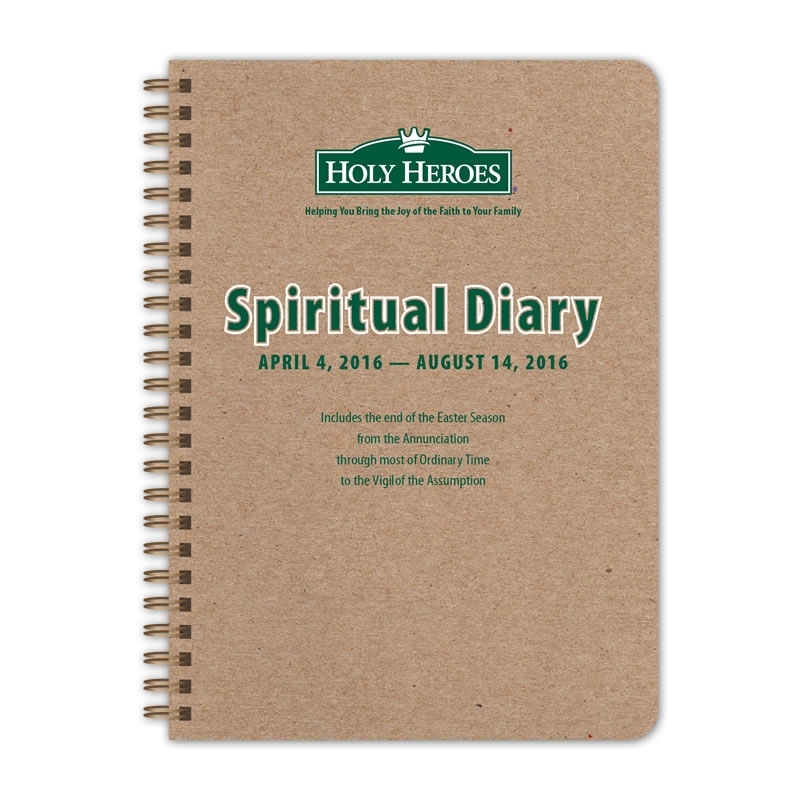 Summer time is a great time to start using the Spiritual Diaries to form a consistent habit! I have found that when our entire family fills out their diaries at the same time together each evening we are more consistent so I always try to make this a goal. After you finish filling out the Spiritual Diary through August 14, 2016, Holy Heroes has the next diary for August 15, 2016 - December 24, 2016 for sale and you can order both as a set and save money! Be sure to visit the Holy Heroes store for more details! For more reviews of the Holy Heroes Spiritual Diaries, you can visit the Holy Heroes website and Holy Heroes Facebook page to see what others are saying about this wonderful product that helps children and adults become more prayerful daily!